Ancylostoma braziliense: This species of hookworm is endemic to the southern United States and is one of the more frequent causes of cutaneous larva migrans in tropical regions. Ancylostoma caninum: In areas such as Sri Lanka and Malaysia, A. caninum is the primary cause of hookworm disease in dogs. 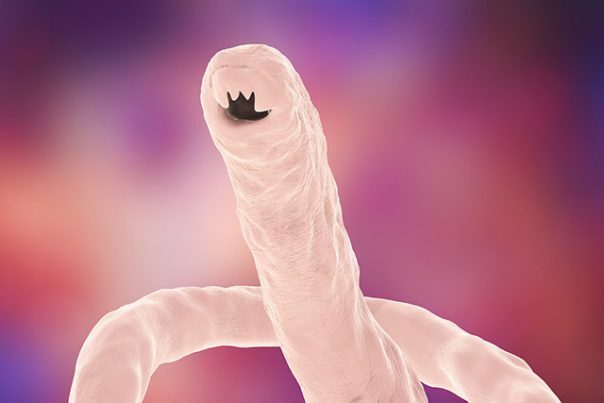 Bunostomum phlebotomum: Also known as cattle hookworm, B. phlebotomum is most often found in the intestines of ruminants, or mammals that obtain nutrients that ferment plants in specialized stomachs. Uncinaria stenocephala: This is a hookworm of dogs that most often occurs in cool and temperate climates, such as the United Kingdom. Any person can acquire cutaneous larva migrans, regardless of their age and ethnicity. Though there are a few factors that can predispose an individual to this condition, namely traveling to or residing in areas where hookworms are native. Engaging in activities that increase the risk of contact with larva, such as swimming or gardening can do this as well. Moreover, there are a number of health conditions, like advanced age, weakened immune system, or even having poor hygiene, that can make a person more prone to cutaneous larva migrans. Persons who have been infected by hookworm larvae will feel a tingling or prickling sensation on the site of penetration within 30 minutes of it occurring. From here, it can take anywhere from five days for a month for the other symptoms to appear. These symptoms, like itching and blisters, can be mistaken as those of another skin condition. However, the main symptom to look out for is the appearance of slightly raised, winding, pink- or red-colored, snake-like rashes on the hands, legs, and buttocks. These rashes are indicative of the path or paths taken by burrowing hookworm larvae. The skin is the organ that usually affected by cutaneous larva migrans. Though depending on the severity of the infection, other organs and deep tissues in the body may also be harmed. For instance, if the hookworm larvae have reached the intestines, then they can cause abdominal pains. They can also create complications related to the blood if they’ve reached the bloodstream. Moreover, the blisters and constant soreness associated with cutaneous larva migrans can make a person more susceptible to other kinds of bacterial infection. Although there are no foods that can impact larvae that have already dug under the skin, there are some that can provide relief from the symptoms of cutaneous larva migrans. Mixing baking powder or tea tree oil with water, for example, is said to soothe the skin irritation caused by larva. Goldenseal and a combination of warm water with honey and green tea are believed to provide the same alleviating effects from redness and inflammation. Even if no treatment is given, cutaneous larva migrans tends to disappear within a few weeks’ time when the larvae die off. Those who wish to speed up treatment will typically be given antiparasitic medicines in the form or oral medication (like albendazole or ivermectin) or tropical creams (like thiabendazole). Removing the larvae from underneath the skin is not recommended as it can result in more harm being done than good. Avoid walking on beaches or soil barefoot, especially if these spots are known to be frequented by cats and dogs. In that vein, one should also avoid sitting or sunbathing directly on sand. Instead, use beach blankets to prevent direct contact with hookworm larvae. Cover any and all open wounds, since these can be used as entryways into the body. Good hygiene should always be followed. Hands must be washed before and after every meal; clothes should be washed regularly and should be dried under direct sunlight. Have cats and dogs dewormed. Wear protective clothing when traveling to areas that hookworms are endemic to. This usually consists of long-sleeved t-shirts and full pants. Cutaneous larva migrans is a parasitic skin disease caused by a wide array of nematode species. A person who has this condition will most often display snake-like rashes on their legs, hands, and buttocks, as well as blisters and itching. Cutaneous larva migrans will usually occur when a person has stepped in sand or soil contaminated with infected feces. This condition tends to go away on its own in time, though a person can take antiparasitic medication to make the process that much faster. As a preventable disease, cutaneous larva migrans can be avoided by following good hygiene and following the appropriate preventive methods when traveling to high-risk areas.